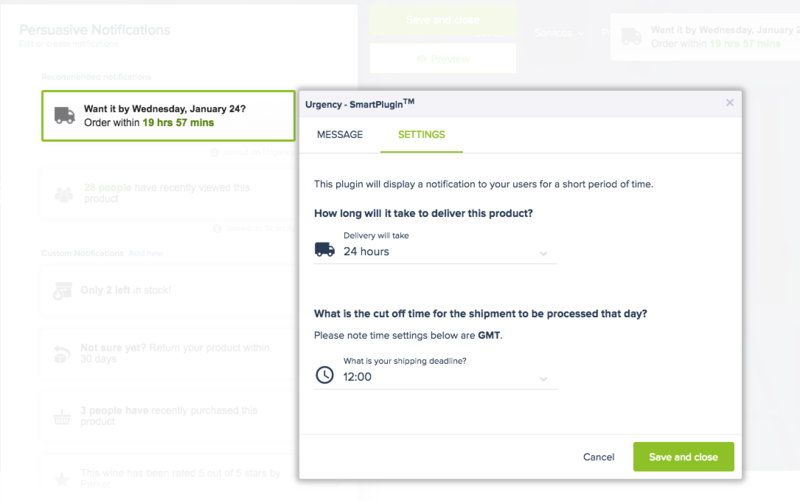 Home Documentation How does the Urgency SmartPlugin™ work? 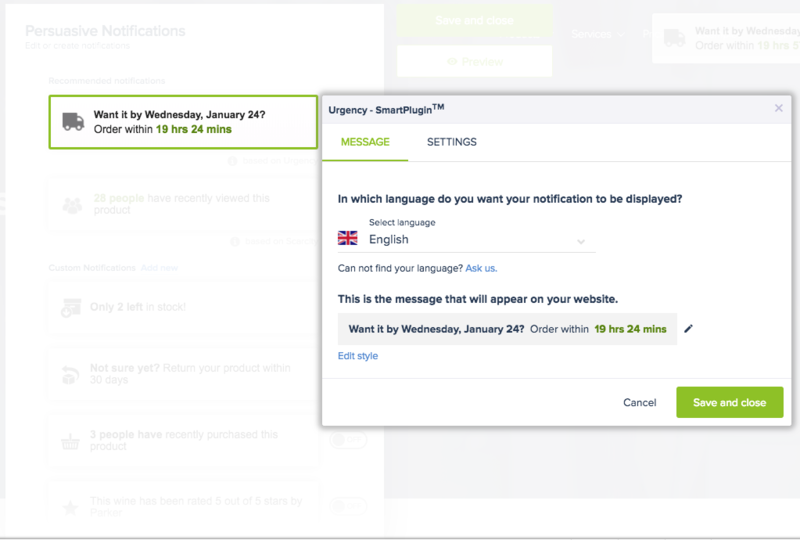 The Urgency SmartPlugin™ enables you to boost customer engagement. It will create a sense of urgency in your customers by displaying how quickly they need to act in order to benefit from next-day delivery (or whatever timeframe you specify). Showing them an exact timeframe in which they need to order before they lose this benefit is a proven way to persuade them to complete the purchase. Please see this article on the Persuasive Notifications Workspace for how to set up notifications. Here you can choose which language to display the notification in. If you want the notification translated into a language not currently offered, please message us using the blue chat icon on the bottom right of the screen. You can also alter the style of the notification using ‘Edit style’. The first parameter to set is the delivery timeframe you want to display. For instance, for next-day delivery, you should choose 24 hours. For 2-day delivery, select 48 hours, etc. The second parameter to specify is the time limit within which users must order to receive their product in the specified timeframe. For example you might specify a cut-off time of 15:00 after which there won’t be sufficient time to process a next-day delivery. Select ‘Save and close’ to confirm your changes, and then ‘Save and close’ once more to navigate out of the Persuasive Notifications Workspace.